In October 2001 The Nelson Society was contacted by Dr. Paolo Gallo Professor of Egyptology at the University of Torino (Turin) and Director of the Italian Archaeological Institute based at Alexander, Egypt (Missione Archalogica Italiana ad Aboukir: MAIA). Dr Gallo’s exciting news was that during excavations of ancient structures on Nelson’s Island, Aboukir Bay, Egypt he had discovered some artefacts, graffiti and burials that he believed related to the British occupation of the island from shortly after the Battle of the Nile in August 1798 to Keith’s and Abercrombie’s landings in March 1801. Dr Gallo was concerned that these burials were under direct threat from erosion, both from the subsidence of the island and general weathering, as well as from human action – the island has become a local picnicking and fishing site. Therefore Dr Gallo was anxious that these graves would shortly be lost along with any scientific information that could be learnt from them if nothing was done to excavate and to re-bury them. Following a preliminary visit to Alexandria and Nelson’s Island in April 2002 by Nick Slope, Vice-Chairman of The Nelson Society (himself a Near Eastern archaeologist) it was decided to support Dr Gallo’s excavation as much as was possible and to this end a plan and budget was prepared and put before The Nelson Society Committee and The 1805 Club Council and the Official Nelson Commemorations Committee (ONCC) were kept informed of developments. The action plan and budget were approved and fund raising, detailed planning and background research commenced. Unfortunately Dr Gallo fell seriously ill in September 2002 and the excavation was delayed by a number of weeks while he recovered. However excavation is now underway and Nick Slope joined the dig on 20 October 2002 in order to excavate and record those burials under threat, study the artifactural evidence and to record and publish the graffiti found, all under the overall direction of Dr Gallo. It was decided that in order to keep The Nelson Society membership and anyone else who was interested up to date with developments that we would post regular updates of progress on the dig on The Nelson Society Website. So watch this space! Nelson’s Island lies approximately 20 kilometres east of the Egyptian port of Alexandria, four kilometres north of Cape Aboukir and guards the northern approach of Aboukir Bay, which is the western part of the Nile Delta. In antiquity Aboukir Bay provided one of the primary commercial routes leading into the Nile River and consequently became a major commercial and religious centre. The position of Nelson’s Island ensured that it too became an important site and Dr Gallo’s excavations that commenced in 1997 are beginning to reveal its archaeological riches. The island itself is quite small extending around 350 metres on a rough north-south axis and about 125 metres at its widest point (the southern end) but as Dr Gallo points out ‘it is small for an island but big for an archaeological site!’ The island is littered with potsherds and the faint outline of walls and structures that await Dr Gallo’s trowel. In antiquity the island was considerably larger than today but erosion, a fall in land height and heavy quarrying of the yellow sandstone of earlier periods have played their part in reducing the size of the island. On the 1 August 1798 Nelson and his fleet discovered the French fleet of Admiral de Bruey lying anchored in a line stretching across Aboukir Bay. In the ensuing battle Nelson and his men destroyed most of the French fleet. During the battle a French garrison and gun batteries had occupied Nelson’s Island but took no part in the action. A few days after the battle, boats manned by sailors and marines from the British fleet captured the island. Most of the dead from the battle had been buried at sea but casualties continued to die from their wounds for some time after and at least two people are recorded to have been buried on the island. Despite Nelson’s victory the Egyptian cost was still held by the French and in 1801 it was decided to launch a full-scale invasion of the Egyptian mainland with a view to driving the French out of Egypt. An invasion force of over 50 ships under the Naval command of Admiral Lord Keith and army command of General Sir Ralph Abercrombie was assembled and on the 8 March 1801 the troops landed against strong opposition on the beach at Aboukir Bay. After a spirited engagement the French were driven from some dominating sand hills and the British prevailed. There followed a number of engagements on the land assisted by sailors and marines from the ships, in one of which Abercrombie was mortally wounded. Many of the troop transports, having discharged their soldiers, were turned into hospital ships and some of those who subsequently died of wounds and sickness were buried on the island. After several months siege and some fighting Alexandria fell to the British on 2 September 1801 and shortly after the French in Egypt capitulated. The evidence for the burials on the island being British from 1798 and 1801 is now overwhelming and falls into a number of categories. Archaeologically the burials contain artefacts of the Nelsonian period such as military buttons, clasps and an unfired musket ball. The burials are very close to the surface and in some cases bones protrude from the ground demonstrating that they are fairly recent (in archaeological terms) and not from antiquity. At least one grave cuts another, which shows that there were two periods of burial and this coincides with the two battles that were fought in 1798 and 1801. Two memoirs of the period record Nelson’s Island in detail. The first of these is by John Nicol a sailor onboard HMS GOLIATH. Nicol records that several battle casualties from the GOLIATH had subsequently died of their wounds and that one of them; a woman from Leith in Scotland was buried on the island. 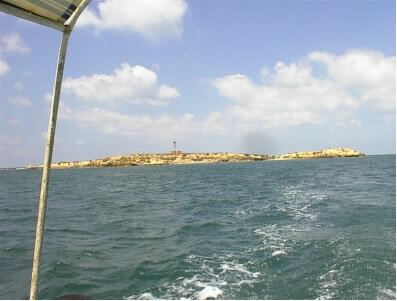 Nicol also states that the island was used as a recreation ground for the sailors. The second memoir is from the Rev Cooper Willyams, Chaplin of HMS SWIFTSURE, who wrote an account of Nelson’s Island. Cooper Willyams illustrated his account with a plate showing the burial of British dead and captioning it ‘the burial ground on Nelson’s Island’. The sailors that came ashore on Nelson’s Island also left their mark. Cooper Willyams describes finding a passage on the island that led ‘…to a dungeon’ that had graffiti in Greek (Byzantine) cut into the plaster on the walls. This passage was actually part of an ancient water cistern and as soon as the good reverend’s back was turned the sailors added their own names, dates and ships that can still be seen today. Perhaps the most revealing insight comes from the ship’s records of the period. The muster and log books of the ship’s involved in both actions record the names of a number of men who were buried on the island as well as giving some details regarding their rank, service (Royal Navy, Royal Marines or Army) age and where they came from and these are tabulated below. 18 March 1801 Abraham Edmonds EUROPA Sailor ? Not all of the ship’s records have so far been consulted and so it is likely that there are more men’s names to be found. The above list has been developed from those who stated to have been buried on Nelson’s Island and those who are thought to have been buried there. Work on Nelson’s Island for the 2002 season has just commenced and already another grave has been found just below the surface as well as some more artefacts relating to the period. Work will continue over the next six weeks and regular updates on progress will be posted on this website. The Nelson Society, The 1805 Club and the ONCC owe a debt of gratitude to Dr Gallo for his persistent attempts in ensuring that British interests have been met concerning Nelson’s Island. He has demonstrated high levels of professionalism, sensitivity and hospitality. Thanks are also due to Mark Stevens H. M. Consul General, Alexandria for assisting and facilitating Dr Gallo’s efforts and for his continued support of our efforts in establishing a cooperative framework with Dr Gallo.